German police have detained the main suspect in the violent attack on a woman in Berlin’s subway, which grabbed media headlines after shocking CCTV footage of it surfaced in December. The man and his three accomplices are said to hail from Bulgaria. The 27-year old suspect, who was not officially named, was detained at a Berlin bus station in the district of Charlottenburg on Saturday afternoon, police reported in a statement. The law enforcement apprehended the man upon his arrival to Berlin when he was still inside a bus. German tabloid Bild reported that one of the passengers on the bus recognized the man and tipped off the police. The bus was reportedly heading to Berlin from southern France, the outlet said citing prosecutor’s office. Dozens of police officers took part in the raid to catch the assailant, who did not resist arrest. The attack itself took place on October 27, but the footage of the incident was released to the public only last week and quickly went viral, sparking outrage among Germans. 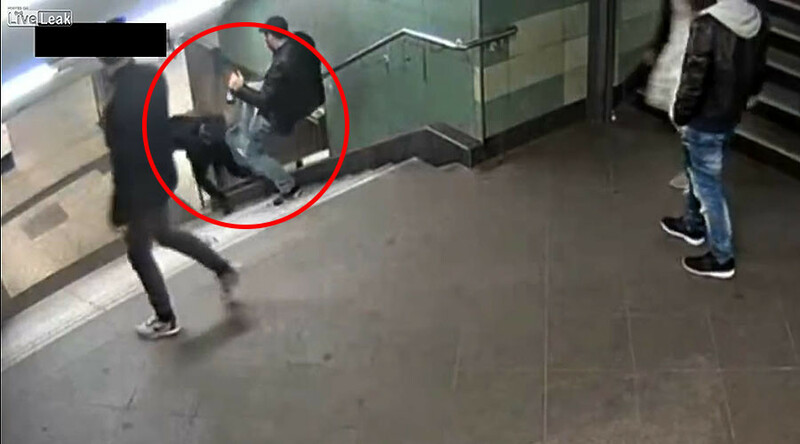 In a video, captured by CCTV cameras on Hermanstrasse U-Bahn (subway) station, a group of four men are seen following a young woman down the stairs before one member of the group with a beer in one hand and a cigarette in another suddenly kicks her down the flight. The 26-year-old victim, who ended up hitting stairs face-on and falling on the platform, suffered a broken arm and was later hospitalized. The group could be seen calmly walking away from the scene as passers-by rushed to the victim’s aid downstairs. On December 14, police reported they identified the attacker and his accomplices. The spokesperson for the prosecutor’s office, Martin Steltner, told Berliner Zeitung on Thursday that the police had started searching for a 27-year-old Bulgarian citizen, Svetoslav S.
The man’s full name was reported by the German and Bulgarian media as Svetoslav Stoykov. The other members of the gang were said by judicial authorities to be his two brothers and an acquaintance. On Monday, one of the alleged accomplices, Stoykov’s younger brother, was detained by German police in Berlin. However, he has since been released, as the prosecutor’s office did not manage to prove his direct involvement in the attack, according to Die Welt. The incident has courted attention not only in Germany but also in the home country of the main suspect, Bulgaria. It was reported that the suspect might have fled to Bulgaria to avoid prosecution. However, this assumption was disputed by the Bulgarian authorities. “There is no information that the Bulgarians from the footage…are in Bulgaria,” the Director of National Police Chief Commissioner Hristo Terziysk told state media on Thursday, admitting that Bulgarian police have been cooperating with German police in the case. Bulgarian television channel Nova reached out to the family of the primary suspect in Bulgaria. The mother of the attacker also dismissed the claims that Stoykov might be hiding in Bulgaria. Stoykov’s wife, with which the suspect had three children, allegedly said that he had called her to tell he was in Germany. Family sources told Nova that Stoykov took up a number unskilled jobs in one of the Berlin’s restaurants where his wife was working as a pot washer. According to Bild, the man was also working at a construction site. Back in Bulgaria the family lived in the Black Sea resort town of Warna in a Roma neighborhood, Berliner Kurier reported. The man is well-known to Bulgarian law enforcement and has a lengthy criminal record, that includes multiple convictions for robbery, theft and hooliganism.